Next month’s Commonwealth Heads of Government Meeting has its transport needs sorted after this week’s formal announcement that Perth-based Adams Coachlines has secured the contract with Murrays to supply buses for conference dignitaries. Motor Trade Association WA Executive Director Stephen Moir congratulated Adams Coachlines, saying it was a vote of confidence and fitting recognition for a very successful local business. 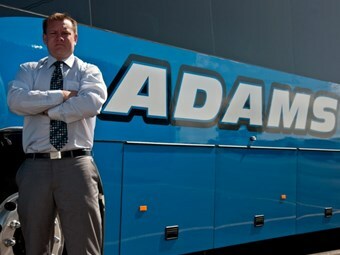 "In a short period of time and as a result of a lot of hard work, Adams Coachlines has become the largest charter operator in Perth and arguably the fastest growing privately owned bus and coach charter company in Australia," Moir says. "There is no doubt they’ve raised the bar when it comes to the standard of service offered by coach lines and they will provide a first class service for the visiting CHOGM dignitaries," he says. Moir says Adams Coachlines ‘distinctive blue buses’ will be noticed by an estimated 2 billion people around the world watching what happens at CHOGM in Perth between October 28 and 30. For Adams Coachlines Managing Director Adam Barnard, pictured, the job of shuttling CHOGM dignitaries is a far cry from how he started off in the transport industry. After a distinguished career in the Royal Australian Armoured Corp, Barnard commenced working for Nightcruiser Party Buses – a bus service aimed at providing quality party bus tours for ‘bucks’, ‘hens’ and partygoers around Perth. "Whether you’re driving CHOGM dignitaries or partygoers around it is all about providing the best service – and we’ve worked hard to establish our reputation," Barnard says. "We’re very big on our presentation and obviously our people." Barnard says he found out last year that Adams Coachlines would be shuttling CHOGM dignitaries around, and to handle the extra work he purchased several new coaches and refurbished and rebranded a fleet of Mitsubishi Rosas. He’s also been busy timetabling the CHOGM schedule, expecting coaches to operate 20 hours a day, two shifts per vehicle – not only during CHOGM but in the days leading up to it. What Barnard is yet to find out is exactly who his coaches and their drivers will be ferrying. "For security purposes I am unable to discuss the details of the transport requirements," he says. "However we have the numbers and we’re planning around that." Barnard says he’s not sure who his company will be transporting. "Obviously heads of government won’t be on the buses but it will be a lot of their liaison officers and staff from the different countries," he says. But certainly for some functions there’ll be some high level dignitaries on the coaches,"